What I haven't mentioned yet are the beautiful, positive moments I witnessed during my visit to the sanctuary. I saw monkeys engaging in natural social interactions. For example, several groups of monkeys - including "Lucky Nine" baboons Missy and Friendly - groomed each other. Also, the monkeys exhibited certain species-appropriate behaviors to reinforce the social hierarchy of their troop (just as they would do in the wild) and they regularly vocalized to share information. Snow monkeys frolicked through the fields of grass and flowers and perched in trees. Baboons basked in the morning sun. Ex-laboratory subject Tweak sank his teeth into a delicious mango. I also witnessed touching improvements in individual monkeys. During my visit, Starbuck, a former research subject, was in the process of being introduced into a troop for the first time. Taz, kept as a pet for 16 years, was practicing his new grooming skills by gently examining a staff member's arm with his fingers. 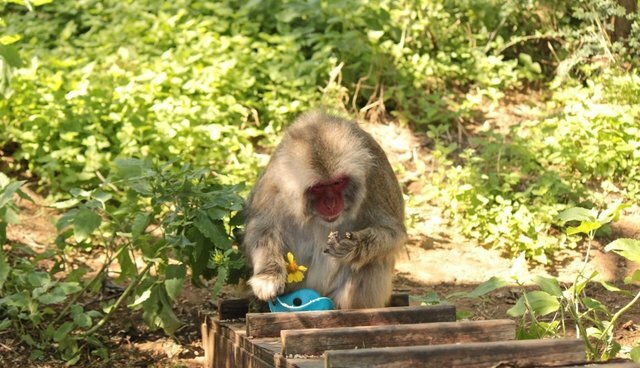 I learned that he recently began to feel comfortable with staff members' presence and was gradually replacing the behaviors acquired during his "pet" years with those typical of wild monkeys (e.g., sitting in the grass, self-grooming, and eating fruits with slight imperfections). Lastly, I had the exciting opportunity to see the monkeys interacting with enrichment items, many of which were generously provided by Whole Foods and friends of the sanctuary who donated items through our Amazon Wish List. On a particularly warm afternoon, Grinch cooled off with a homemade ice treat. India curiously inspected a Kong filled with delicious and nutritious food. Gilbert squealed with joy as he discovered the pistachios hidden in a toy. A young pig-tailed macaque leapt around the enclosure with her Little Red Riding Hood cape (a red blanket). After extracting the contents from a Whole Foods natural Easter grass box, mischievous Buddy decided that the box would make an excellent hat. These are the stories I will remember when I look back on my trip to the Born Free USA Primate Sanctuary. These inspiring stories leave no doubt in my mind that even monkeys who have suffered at the hands of humans have a legitimate chance at happiness and hope, if given the opportunity to thrive. My final takeaway from the sanctuary trip is what an incredibly vital and needed service the sanctuary provides. Despite the increase in our knowledge and understanding of nonhuman primates - specifically their intelligence, their profound cognitive abilities, and their undeniable similarity to us - the use of nonhuman primates as research subjects and pets continues. I truly hope there will come a day when sanctuaries like ours are not necessary. But, that day has not yet arrived. Until then, the Born Free USA Primate Sanctuary will be there to provide the highest standard of care for monkeys whose right to live free and wild was denied them. As residents of our sanctuary, they have a chance at a brighter future: the freedom to live as wild and natural a life as possible, and a reason to believe that there is joy and beauty beyond the shackles of captivity.